Nuclear waste was illegally dumped near the Indian reservation where Barney Runningbear grew up. While the child was only eight years old, the nuclear waste polluted the water supply for the community and his entire family was killed by the radiation. Barney only survived due to a genetic anomaly, which mutated him into a strange looking being of immense power. The orphaned boy was briefly taken in by a family in Everett, Washington (Dusty, Tracy and Betty Root) but their home was destroyed due to rioting neighbors that didn’t want a freak living in their neighborhood. This caused a distressed Barney to run away from home and try and make a life for himself on the streets. Falling on hard times, Barney became a petty thief, who in turn led him to meet a young mutant girl named Rikki Shaefer and the two became friends. Both superhuman youngsters were both arrested for their crimes and eventually relocated to Arizona and the Mutate Manpower Management Service, a super-villain detainment and rehabilitation unit that was, in fact, a freak work camp headed up by Dr. Verlag. It was there that Barney was codenamed Barbaric and Rikki Shaefer was codenamed Ricochet. When the M.M.M.S. started to develop mind control devices to keep prisoners in line that wouldn’t do their bidding, Barbaric, Ricochet and Jerry (Inhabiter) Steele made a break for it. When it appeared that Jerry had been shot dead, Barbaric and Ricochet escaped on their own, deserting their best friend. The two fugitives set out on a desperate quest to remain free and could not afford to stay settled for long. They found their way to Chicago where they hid out in the city’s underground, living with other homeless freaks. It was there they met and befriended Officer Dragon. The super powered policeman persuaded Barbaric to join the Police Department, his girlfriend too young at the time, and joined up with what they unofficially called, their “Freak Force” program. While involved in this project, the Barbaric was introduced to some of the closest friends that he’d ever meet; Dart, Rapture, and Horridus. Due to restrictions imposed by the local government and their police superiors, the freak officers quit the police force and struck out on their own as bounty hunters, joining up with the veteran hero SuperPatriot and the new Mighty Man. 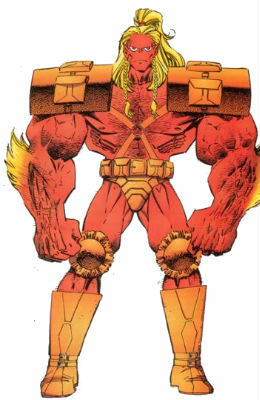 Eventually, Barbaric accompanied most of his teammates in joining the United States government’s new super team to replace Youngblood (presumed dead from the Martian attack), the Special Operations Strikeforce. Within the first few months of his tour of duty, Barbaric proposed to his long-time girlfriend Ricochet and were married. Following the conquering of the Earth by CyberFace, the world fell apart and Barbaric and Ricochet found themselves recaptured by the MMMS. They were transported to Australia where Dr. Verlag had struck up a partnership with the country’s prime minister, BrainiApe. Dragon liberated the slave camp, allowing Barbaric and Ricochet to relocate to the United States. Over the next few months, Barbaric and Ricochet landed their own television show which prompted them to lose enthusiasm for crimefighting. They both put on a great deal of weight and only met up with their former allies at the funeral of Dart when she was accidentally killed by an angry Mako. The couple has recently been lured back into action with both the short-lived Freak Force venture and the mission to take down the renegade Mighty Man V. Barbaric and Ricochet ended up getting into shape again during Mister Glum’s control of the planet due to the tough work involved. Barbaric and Ricochet are later fired from their TV show due to being beaten in the ratings by Lamp Chop. After a battle with Kill Crazy they decide that it’s time to join the S.O.S. and fight crime again. Barbaric and Ricochet later help Betty Bradford in controlling her powers and help their teammates fight the Battlin’ Bulldogs. He later helps during the aliens attack on Earth. Once the realties merge, he leaves SOS and joins the new Freak Force.